U.S. National Security Adviser Gen. H.R. McMaster, by rejecting the term "radical Islamic terrorism," appears to be ignoring the ideological, cultural, religious, political and economic factors behind global jihad. 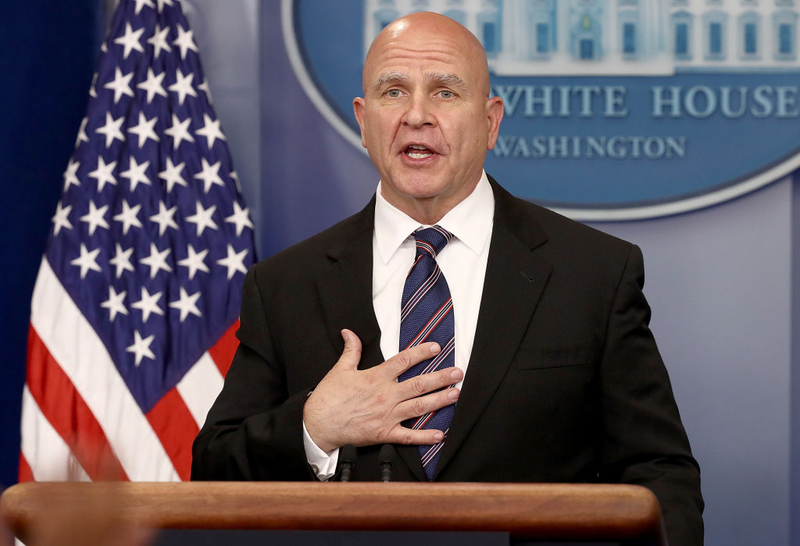 It is as if McMaster believes that the terrorists' war against the West emerged out of nowhere -- unconnected to a multi-pronged logistical foundation and network. A Palestinian state would quickly become a theocracy -- an ISIS clone, denying its citizens exposure to Judeo-Christian culture, as Islamists are currently trying to do in Europe, Australia and Canada. Despite considering Iran a grave threat to the Middle East and the rest of the world, the U.S. establishment opposes canceling the nuclear deal, and instead apparently prefers to provide the Islamic Republic's theocratic regime with the logistical means to continue developing its nuclear weapons program. U.S. National Security Adviser Gen. H.R. McMaster, for example, by rejecting the term "radical Islamic terrorism," appears to be ignoring the ideological, cultural, religious, political and economic factors behind global jihad. It is as if McMaster believes that the terrorists' war against the West emerged out of nowhere -- unconnected to a multi-pronged logistical foundation and network. The same can be said of the American media, the Justice and State Departments and the intelligence services -- and not only in relation to terrorism. The American establishment also seems to be suffering from a similar form of tunnel-vision in relation to the Palestinians' quest for a state, by ignoring the fundamental logistics behind it. Under the best circumstances, any state created would not be like Denmark. The reality is that such a state would adopt the political and institutional nature of the totalitarian regimes of the Gulf countries, just as Hamas did in the Gaza Strip after Israel's withdrawal in 2005. A Palestinian state would survive through funding from regimes such as Iran, Qatar and Turkey, and continue to serve as their proxy in the region. Similarly, it would quickly become a theocracy -- an ISIS clone, denying its citizens exposure to Judeo-Christian culture, as Islamists are currently trying to do in Europe, Australia and Canada. Witness the attacks in Europe on Paris's sports stadium and the Bataclan theater in November 2015, or on young girls listening to music in Manchester on May 22, 2017. Or the attempted Christmas bombing in Australia and attempts further to silence free speech in Canada. The time for the United States and the rest of the West to tackle global jihad and the extremism that leads to it is long overdue. overdue. Thank you, Maria Polizoidou for getting this message out. Great article! I was sickened when president Trump took on H.R. McMaster as a security advisor. We can see his influence already and it is apparent Mr. Trump isn't as well informed as he made out to be prior to the election. A novice could have seen from a 1000 miles that McMaster is a disaster for America and the world. Nothing will change on his watch and ultimately Trump will have a failed presidency just like GW Bush and Obama. America needs to wake up. The constitutions of Iraq, Afghanistan and now Libya all state Islam is the official state religion and Sharia is the law of the land. 5000 dead soldiers, 25000 wounded, 3 trillion dollars spent to establish 3 Islamic states. Insanity reigns in WDC and the US media is clueless!!! So is the Trump administration!!! HR McMaster who was appointed by President Trump as his National Security Advisor rejects the term "radical Islamic terrorism." That is in total opposition to the President and sounds like it comes right out of the Obama administration. Rex Tillerson who was appointed by President Trump as his Secretary of State rejects President Trump's policy on Qatar. The President who is supporting the new Arab alliance that he helped craft against terrorism is being undermined by Tillerson who turns a blind eye to Qatar's alongside of Iran's continuing financial support of UN designated terrorist organizations. Whoever vetted these guys needs to be fired. So does McMaster and Tillerson. In 1930, before Hitler came to power and before he became Prime Minister, Winston Churchill warned of the danger Hitler posed to the Continent. He could do so because he had read Mein Kampf, Hitler's Magnum Opus that detailed exactly how he was going to return Germany​ to a regional power and reclaim German honor, lost by the harsh strictures imposed by the Treaty of Versailles. The British political elites pooh-poohed him and ignored his warnings to the detriment of the Continent...and the world. In ignoring the threat Islam poses to the West by refusing to name the threat, Gen. McMaster is seeking to appease those who are acting on the tenants of their faith to the detriment of Western values and rule of law. The General, in an attempt to garner favor with those who wish to destroy us, has channeled the spirit of Chamberlain, when he should have channeled the spirit of Churchill, for in history lies the crime of repetition should you refuse to learn the lessons it teaches. McMaster is a general and thus knows that the first rule of war is "Know the enemy!" Every single terror attack, suicide bombing, car ramming, knifing is always done by Muslims. This alone should wake up the Alzheimer afflicted McMaster to the truth: The free world is under attack by none other than Islam with Islamic terror.